Featuring ski equipment hire and an outdoor pool, the Hotel Monjas del Carmen also offers ski passes and air conditioning. This 3-star hotel is just a stone's throw from Albaicin's lively nightlife. The Hotel Monjas del Carmen provides multiple facilities including a coffee bar, bicycle rental and a 24 hour reception. Wi-Fi is accessible within the hotel, ensuring you'll have no issues staying connected during your trip. Guests can also take advantage of the hotel's shuttle service and the tour desk services. The Hotel Monjas del Carmen offers modern and large rooms equipped with a flat-screen TV, cable / satellite channels and complimentary toiletries. A laptop safe, an in-room closet and a private bathroom can be found in each room of the hotel. A desk with an electrical outlet, heating and a desk are also provided in each room. The lively restaurant at the Hotel Monjas del Carmen is open for breakfast and serves Mediterranean dishes. For those wishing to dine out, there is a variety of dining options surrounding the hotel. Situated close to a number of popular hot spots, the hotel is near many bars, nightclubs and quality restaurants. Generalife and the Palace of Charles V are under a 20-minute drive from the hotel. 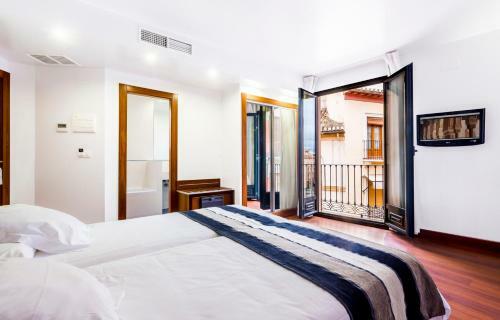 This hotel is 1124 metres from the Alhambra entrance, 111 metres from Plaza Nueva (the absolute centre of Granada), 1520 metres from the train station and 2903 metres from the bus station.